Do you want to be an entrepreneur and accelerate clean-tech inventions? 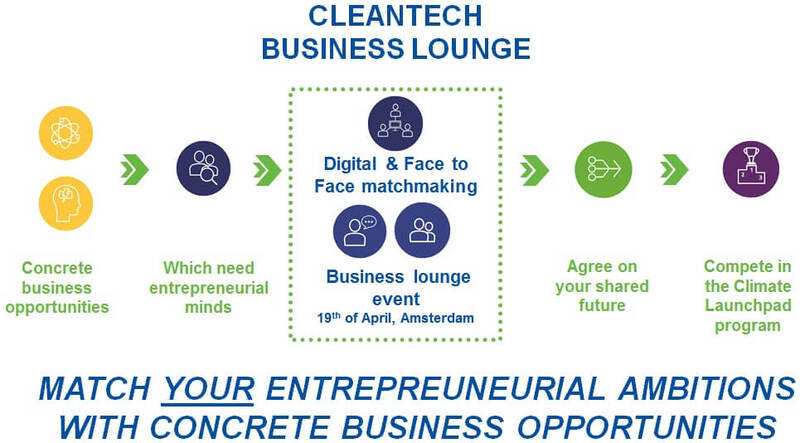 Be part of this Cleantech Business Lounge on 19 April. Future entrepreneurs have the opportunity to meet a select group of inventors with great business ideas. All are looking for entrepreneurial minds to bring their solutions to market. We have selected a range of inventions which are ready to enter the market. The inventors would like to get in touch make their invention a business success. The inventors will showcase their business opportunities at the Cleantech Business Lounge. It is up to you to let them know that your are interested in becoming part of the entrepreneurial team. An integrated solution for reduction of energy usage in buildings. Looking for an all-round CEO, with a strong commercial focus. Improved control over climate conditions in a greenhouse to regain both sensible and latent heat without excessive electricity use. Looking for climate system developers, producers and installers. Allows existing ventilation systems to be easily modified to increase overall efficiency. Looking for entrepreneurial minded people, focus on Business to Business sales and/or a technical background. An unique assessment-method for urban innovations, an European library and showcasing service for interesting innovations. Looking for a genius in content marketing and a front- and back-end developer to improve our website and online position. Data driven software solution to increase R&D efficiency and accelerate development of sustainable chemical products and processes. Looking for entrepreneurs in the financial/marketing/chemical industry technical roles. Develop a relatively low-cost multispectral camera that measures air pollution not only at the surface, but also throughout the atmospheric boundary layer. Looking for entrepreneurs with technical expertise about sensor development and a strong focus on simplification and cost reduction and entrepreneurs with expertise to sell new technology to governmental agencies. Involving the general public via their smartphones in collecting data and providing the public with feedback and knowledge to contribute to the willingness and therefore effectiveness of the abatement strategies. Before the event starts on the 19th of April, you get access to the selected inventions. You are given access to our online tool where you can review our selected opportunities and schedule a meet and greet at the event. The business opportunities are developed by large research institutes and universities so it is up to you to come to an agreement on the terms and conditions that will apply. Once you have agreed on your shared future, you can choose to compete in the Climate-Launchpad programme. Specifically designed for entrepreneurs who are establishing an enterprise. If you have what it takes, ClimateLaunchpad could be your ticket to business success. Click here to apply and let us know in which venture you are interested. We will get you in touch with the inventors before the event has even started. If you are not sure in which invention you are interested; no worries. Just fill in the application form and you can make your selection during the event. Please contact Eelco van IJken, Innovation Manager Climate-KIC The Netherlands, for more information.